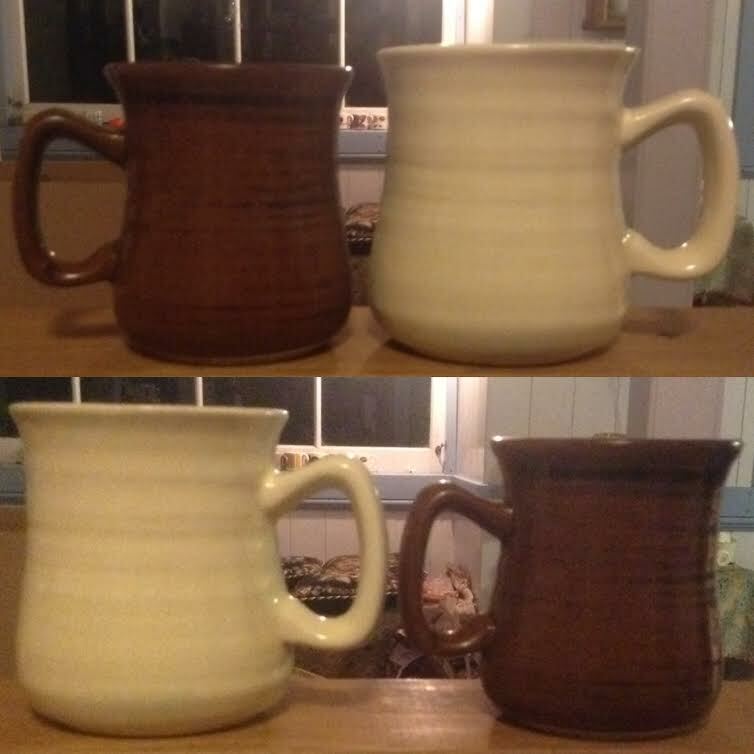 white - "Castle Pottery closed down 35 years ago ..."
"Castle Pottery closed down 35 years ago ..."
I haven't spent much since the Wharetana mug so I picked up this modest castware mug at SPCA Kamo, then saw another identical at Sallies (right). Whatever they are they are out there. Soft foot ring no marks. Any ideas? It is the same shape as the random off-white mug, down to the soft footring. It is between 5 and 10% smaller than the off-white one, which in this instance works out to an astounding 40% reduction in volume. The size difference could be caused by differences in body and/or temperature and/or time. From the ring it may be stoneware, but I am not absolute on that. Curiously the large white mug looks "wrong" but the smaller version in a more interesting glaze looks quite nice. The two mugs above are the same shape as Castle Pottery mugs. Oh, btw, foot rings match too. Re: "Castle Pottery closed down 35 years ago ..."
Thats interesting.. Castle Pottery must have been quite productive. Kat, so far I've only seen the two named mugs and the wine barrel from Castle. I guess the P Sinclair one is yours but did Jim have a Castle mug too as that would make four? As these two mugs are not marked I can only guess that they too are Castle, however, the basic mould MAY have been used by others. 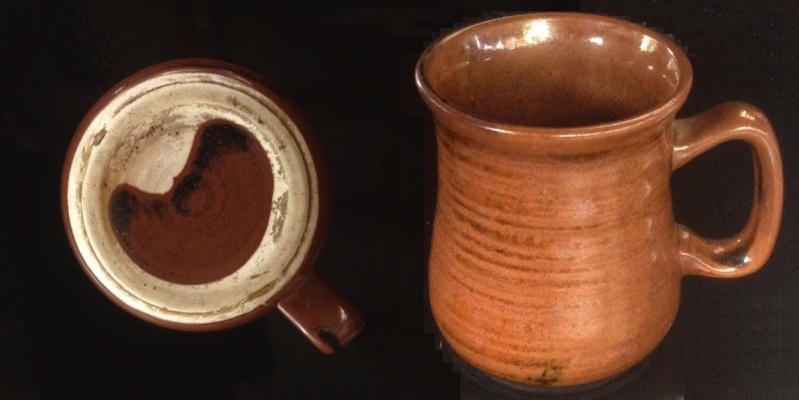 We've seen examples of Hemara reusing shapes from one pottery at others AND less interestingly shapes bought as greenware or bisque sold for home-glazing such as the Titian Hei Tiki mug and one Kiln Craft mug. I will watch for this shape in future, as it is burned into my brain now, with an eye to spotting makers' marks. The one I think looks like Tenmoku is the tidiest of those I have seen, although the base looks a bit messy. There have been quite a few Castle listings made at that pottery lately. It's just great when we get some info from the people who worked at these unknown potteries. "Castle pottery was started/owned by Peter & Carolyn Hood for approx 2 years & operated from their home in Silverdale until they moved to Australia.They mostly made promotional mugs for companies.Thats about it.Thanks"
Maybe someone knows the names?